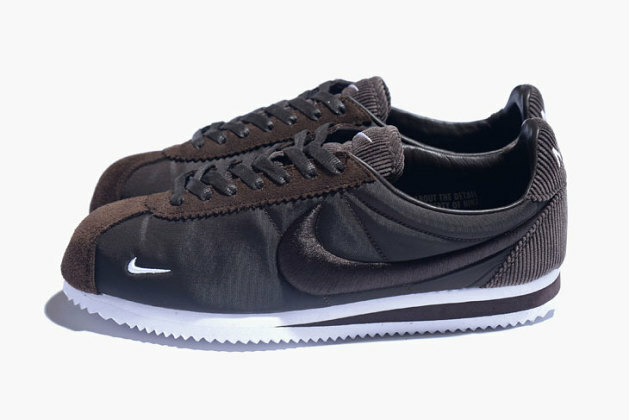 This latest iteration of Nike’s iconic Cortez sees the retro silhouette taking on a new persona that doesn’t fit in the OG mindset but certainly will find its way onto the wishlist of many this Spring/Summer 2015 season. The tonal kicks see dark uppers paired with a silky brown swoosh and intricate accents of brown suede and brown corduroy for good measure. Continued onto the tongue, the corduroy adds depth and intrigue to these classic kicks, all the while featuring a clever double Nike check in the form of a white mini check next to the toe-box. These kicks come leather lined and perched atop a white and brown color-blocked sole. No exact release info as of now but as always stay tuned to MN for the latest on these and other interesting pending releases.